There is no doubt the period that lies ahead in October and November is a testing one. The chief cause of this is the passage of the red planet, Mars. Mars is the warrior god, ruler of male energy and sexuality, vigorous action, assertion, muscular or instinctive responses, weaponry, sharp blades, blunt instruments, impacts and blows or percussion. In the early days of his mythological growth in Roman culture, Mars was a woodland deity, associated with wolves. He divided the cultivated land from the wild and would set a sacred boundary between them. If that boundary was crossed by an invader, he would become a soldier and fight in its defense. Later on, in the days of empire, he was reduced to the role of soldier only. Under positive influences, Mars can lead the way with courage, honesty and an indomitable will that powers the head and heart to their best. Negatively, Mars causes strife through selfishness, impatience and aggressive or violent behaviour. There are two main reasons for the Martian effect at this time. The first is that the warrior god is close to the Earth, intensifying from above his influence here below. The energy and impact experiences summoned by the red planet will predominate for us. It's therefore up to us to see that we not only properly restrain our frustrations or aggressive behaviour so that they do not lead to violence but also promote the best and highest acts of initiative and leadership that show the way forward. There is no magic button to press, other than the one installed by us as we've developed maturity of character, realizing that lashing out because we're frustrated or can't get what we want is selfish and destructive. Astrology is the science of returning energy. Everything that happens has happened before and will happen again. It's only a question of when and by what margin. In this instance, Mars and the Earth come close about every twenty six months, as the Earth's smaller orbital pattern allows her to lap the red planet in a race around the Sun. It is interesting that H G Wells' story, The War of the Worlds, recently popularized yet again in film, was conceived as having occurred at just such a time when Mars is closest to the earth, bringing a ruthless invader to our native soil. What role does fear play when the war god comes? He is a fearsome figure, bearing with him his two moons, Phobos (fear) and Deimos (terror), named for the twin horses that drew the chariot of the Thracian god of conflict and strife, Ares, ancestor to Mars. Where are our boundaries? What are our capabilities? Who is friend and who is foe? These may be interesting questions to examine during the close pass of the red planet. Wells' story was the forerunner of many in the modern era, stories that tell of the transformation of the ordinary human into Mars the soldier so the sacred boundaries of the Earth can be defended. Is the ruthless invader of imagination simply an expression of a shadow in ourselves that we do not have the courage to own? It's important to remember that, in the original Wells' story, the humblest beings in creation saved humankind while the modern weaponry and science of human achievement failed at every turn. Will the war god bring the 'war on terror' closer to our door? And will it be the simple human values (Taurus) that will save us from the worst of this? We shall see. This brings us to the second important influence from planet Mars. The warrior enters a retrograde (reverse motion phase) on Oct 1st, heightening the influences we have already felt in August and September and continuing to intensify them until early Dec when Mars comes to station and begins moving forward. Even then, the 'Mars' effect will take us into February when the red planet at last returns to the point at which he began his backward journey. He makes this reverse journey in Taurus, sign of the Bull, where the importance of material possessions, physical desires and simple values is emphasized. Watch for accidents with sharp or blunt instruments through impatience. Watch for problems with beef cattle (ruled by Mars in Taurus) or the beef cattle industry. In this time, we may be overly possessive or inclined towards accumulation or indulgence in the physical world. Equally, we may set ourselves against others or have others set themselves against us because of strife over money or possessions or because of a clash of values. Developments or changes in October and November will bring challenges with what we value. The importance of material possessions and financial security may come under question, as will the means by which these can be achieved. There may be fluctuation or change in the share and money markets. What has been 'gilt-edged' may have the gilt scraped away, revealing little of value beneath. Conversely, there may be a return to basic values and investment in simple, traditional sources of wealth. The commodities market may flourish again though 'for how long' is another question. Regions that have been strife torn with flood and storm in recent times may be powerful teachers in regard to the value of fresh food and clean water in a place and time where all the money in the world can't buy them. At a personal level, it will be important to slow down and enter a process of review as to what is of real value in our lives and in our search for happiness. No doubt there will be a call to action for us to work on what has been spoiled or needs re-doing. However, we may also be able to work with the simple spiritual truth that some problems can solve themselves if we wait patiently for things to change of their own accord. Mars loves forward motion and action so the retrograde phase is never a comfortable one for him. With Mars in reverse, we will experience obstacles, delays and frustration as the energy inclines us to internalize and review rather than externalize and express. We may be in too much of a hurry to do things. We may find our judgement in the execution of normal everyday actions is not up to scratch. Thus, it will be all too easy to bump into the furniture or clash with things or people that seem to get in our way because we haven't read a situation correctly. With energy internalizing in this manner, the red planet can become a dangerously explosive stockpile of introversion or aggressive self-absorption. It can be harder than usual to see beyond our own feelings or wants to those of others or of the situation we're in. A planet in reverse motion tends towards a more magnetic style of operation. Thus, Mars in reverse may magnetically draw towards us people, events and experiences that will become the triggers for a stockpile of anger or frustration that we've hidden away or held over from the past. On Oct 1st, as Mars turns retrograde, he will do so in opposition (180 degrees) to Venus in Scorpio. Mars and Venus in harmony bring exciting and fascinating social, romantic and sexual interactions. Under tension, they can cause conflict, either socially or between the sexes. The fascination of opposites can erupt into ill-feeling or ill-judged action. Mars in Taurus can take a long time to rouse. However, the feelings or desires once roused are fearsome and determined in their expression. With Mars retrograde, bottled-up feeling can overflow, blighting the social and sexual arenas of our lives, at a personal and a public level, bringing bitterness or frustration over past events. This can occur directly with those concerned or it can be a transfer of frustration to something or someone else. The simple advice with this is to get things off your chest or out of your throat (ruled by Taurus) by talking them through in an effort to come to terms with what has happened in the past. When the warrior turns his face backwards, he does so near the fixed star Caput Algol, head of the Gorgon, an image drawn from the myth of the beheading of Medusa by Perseus. In ancient thinking, the head was a repository of traditional wisdom and any beheading myth, such as this or that of John the Baptist or the British King Bran carries the image of the passing of encoded wisdom from one generation to the next. The mouth of the severed head of wisdom was regarded as a fertilizing well of magic and knowledge. What we see in this particular version of the myth is that the head of wisdom belonging to the ancient goddess is taken by male violence and weaponry. Perseus is a usurper, stealing the fount of the feminine and claiming it on behalf of men and the sword. Traditionally, this placement is regarded as one of ill-omen. While modern astrologers continue in their attempts to soften the harder edges of ancient thinking, the reputation of Algol for the most part holds true and sharp like the edge of a well-honed weapon. Algol is the fury of the thwarted feminine. The consequences of her influence are bitterness over the past, revenge, wild passion, murder, violence and beheading. It's important to remember that losing the head of something may have a wider symbolic meaning as well as the literal one. Someone at the head of an organization or even a nation may stand in danger, either literal danger or in danger through the loss of the faith or confidence of the people. Personally, we all may be in danger of 'losing our heads' in a bad moment. In part two of this article, Neil Giles examines the effects of the fixed stars and the planets on our lives during this testing period. 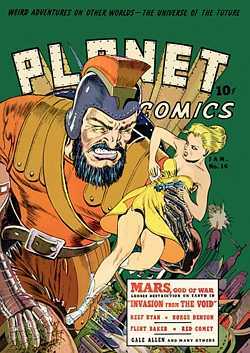 Click to read Part Two of The Red Planet.